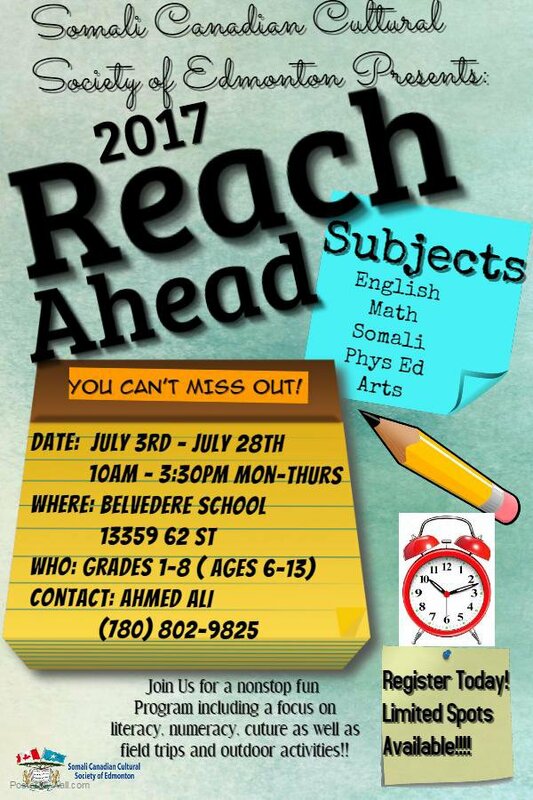 Somali-Canadian Cultural Society of Edmonton (SCCSE) along with the help of the organizations mentioned above held our yearly summer program, “Reach Ahead”, scheduled from first week of July to the end of July at Killarney Junior High school. The program was primarily created as an extension of homework club and has been successful since its establishment in the summer of 2009. It is a four weeks interactive summer camp program targeting Somali-Canadian children aged between 5- 15 years old (Grades 1-9). The program provides an opportunity for children and youth to strengthen their skills in core subjects such as Math and English and also participate in other activities such as Arts, Somali Language, Gym as well as field trips. What makes the summer program unique is the addition of culture learning in which the students get the opportunity to learn of their culture, heritage and improve on their first language proficiency.